Product Details for White Blazing Star Botanical Name: LIATRIS SPICATA 'ALBA'Spring Hill Name: White Liatris, White Blazing Star Common Name: White Liatris, Blazing Star or Gayfeather Form: Clump forming Root System: Bulb Sun Exposure: Partial Shade/Full Sun Height/Habit: 18 - 36" Spread: 12 - 18" Spacing: 12 - 18" Growth Rate: Moderate Hardiness Zones: 3 - 9 (-30 degrees F) Flowering Date: Mid to late summer. 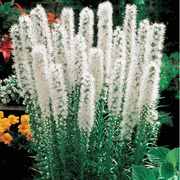 Duration: 3 weeks +Flower Color: White.Flower Form: 1' Stiff bottle-brush of dense flowers at top of each spike, opening at the top first and continues blooming downward. Foliage Type: Unbranched, erect stems with thin lanceolate grass-like, mid-green foliage. Ground Covers: Yes Borders : Yes Cut Flowers : Yes Dried Flowers : Yes Good For Other: Meadow Garden Soil Requirements: Well-drained, moderately fertile, sandy soil/tolerates excess soil moisture in summer but not in winter. Unique Characteristics: Long lived perennial bulb, that increasingly multiplies in size. A favorite of florist's, outstanding cut flower that has a long vase life. Great textured plant, that starts with fine grass like foliage, and becomes sharper with the vibrant colored bottle brush blooms. priced per bag of 5 bulbs.